Background: Titanium dense and porous structures are widely used as maxillofacial and orthopaedics implants due to its excellent mechanical properties, corrosion resistance and biocompatibility. Additive manufacturing allows the fabrication of implants with improved mechanical properties and modulus of elasticity close to that of bone. Objective: The aim of this study is to evaluate the functional and anatomical aspects of the mandibular bone response on implantation of electron beam melted titanium dense and porous plates. Methods: A total of 10 mandibular reconstruction plates are custom designed and fabricated using Electron Beam Melting (EBM) technology and are implanted into the mandibular region of goats. The EBM plates are then assessed clinically using radio graphical analysis to study the functional and anatomical aspects. Results: The EBM fabricated plates remained stable throughout the study of 12 weeks indicating anatomic and functional stability. At post-operative, there was good wound healing at the surgical site without any dehiscence of body reaction. Conclusion: The study demonstrates that the EBM fabricated mandibular reconstruction plate’s exhibits good biocompatibility in addition to anatomical and functional stability. Additionally, histopathological study is necessary to further evaluate the tissue reaction around the EBM reconstruction plates. Titanium and its alloys have found widespread use in medical application due to its low density, high mechanical strength to weight ratio, biocompatibility and good corrosion resistance. Titanium when exposed to air or water, complex reactions takes place at bioenvironmental/oxide interface and a passive film forms on the surface which serves as a protective barrier against oxidation and corrosion . The passive film formed on the titanium material is dense, protective, adhere strongly to a substrate and provides favourable Osseo integration . Titanium based implants are widely used for the reconstruction of lost bone structure in dental application [3,4]. Due to the large number of implant reconstructions, there is a growing demand for new and improved orthopaedic implants. More specifically, there a need to produce a novel load bearing implant with modulus of elasticity closer to that of bone and consequently increase the life-span of the implant. AM techniques demonstrations a great potential in the fabrication of customized design implant with porous structures for bone tissue engineering applications . Conventional manufacturing process fails to produce a desired or controlled porosity structure . The introduction of metal based layer manufacturing technique such as Selective Laser Melting (SLS) and Electron Beam Melting (EBM) allows the modulation of level of porosity and tailoring the modulus of elasticity of the implant to match the modulus of bone [7,8]. EBM technology uses computer controlled electronic gun to create fully dense three dimensional objects from metal powder. The resulting quality is high, as the entire process is conducted under vacuum and held at high temperatures during the entire build. It is a FDA (U.S Food and Drug Administration) approved technology used by ARCAM for 3D printing medical implants . EBM process is fully computer controlled process with less human intervention. A more thorough process of EBM is available elsewhere [10,11]. Recent studies have shown that the EBM technology is the best suited for custom-designed implants with modulus of elasticity closer to that of bone . The Ti6Al4V material used for the EBM process has proven to have good mechanical and chemical properties for implants [13-15]. Ti6Al4V has a particle size of 45-100 μm obtained from ARCAM AB, Sweden. The chemical composition is in the form of Aluminium 6%, Vanadian 4%, Carbon 0.03%, Iron 0.1%, Oxygen 0.15%, Nitrogen 0.01%, hydrogen 0.003% and the rest Titanium . The metal plates manufactured using EBM are stronger than commercial plates and have a finer microstructure due to their rapid cooling when compared to the bulky components that are readily available on the market . Derand et al. described the work flow for the design and fabrication of patient specific mandible implants using EBM process . Xiang et al. fabricated porous Ti6Al4V mandibular implants with controlled porosity and analysed the mechanical properties and surface modification with biomimetic approach . The metal plates manufactured using EBM are stronger than the commercial ones with finer microstructure of the finished part due to rapid cooling . Previous studies have shown a 35% cost reduction for customized implants produced using EBM when compared to the conventional methods . In this study, we have fabricated two types of customized plates- dense and porous using Ti6Al4V from EBM process to evaluate the implant effects on goats. Customized dense and porous plates are implanted bilaterally in the goat’s mandible for a period of 12 weeks. Later, radio graphical analyses are performed to examine the functional and aesthetic conditions of the plates. Ten male goats, with a mean body weight of 25.29 ± 0.59 Kg and mean age of 18 ± 1.5 months, were housed at the animal holding facility situated in the Laboratory Animal Center of King Khalid University Hospital at King Saud University, under veterinary supervision. The CT scan of the goats was performed to get the DICOM files. The DICOM files are processed using Mimics®, medical image processing software by Materialise. Considering the case of the first goat, the obtained layers of 2D data of DICOM files are stacked together to form a typical 3D data model as shown in Figure 1. Figure 1. Mimics file visualizing the goat facial axial view (top right), accompanied by the coronal plane (top left), sagittal plane (bottom left), and 3D surface models (bottom right). Figure 2. Customized Porous plate design: (a) Full facial 3D surface model, (b, c) segmented and obtained lower jaw , (d) Outer skin layer selection for implant design , (e, f) Extracted and designed outer skin layer for implant plate (g) Offset 2 mm plate thickness, (h) Cutting path for porous structure, (i) Porous structure generated (j) Porous structure merge with the other dense part, (k) Cutting the bottom porous region, (l) Reconstruction plate without porous structure. • The obtained 3D surface model of the goats is imported into 3-Matic® (Figure 2a). • Segmentation and region growing techniques using 3- Matic® are performed to separate the lower jaw from the upper jaw as described in Figures 2b and 2c. • The outer skin region of the implant position is selected by creating a new smooth curve on the lower jaw as shown in Figure 2d. The smooth curve is trimmed as per the design plate (Figure 2e). • The designed outer skin region is separated from the lower jaw (Figure 2f) and an offset thickness of 2 mm is provided as shown in Figure 2g. • A cutting path is provided on the lower portion of the designed reconstruction plate for porous structure as illustrated in Figure 2h. • The bottom portion of the separated part is imported into Magics® structural model for generating porous structure. The structures are then merged with the other portion of the reconstruction plate to get the final porous reconstruction plate as shown in Figure 2i. • The dense plate (Figure 2l) without porous structure is obtained by cutting and trimming the porous part (Figure 2k) from the obtained porous plate design. • Smoothing, trimming, screw hole drilling and other finishing operations are performed on the designed reconstruction plate to get the final finish. 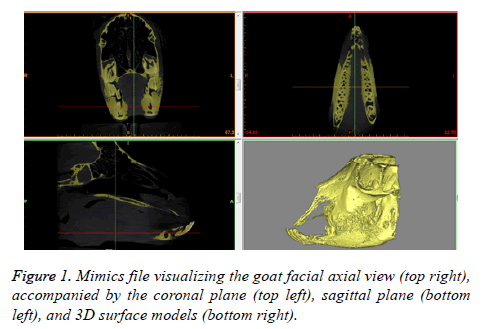 Both the customized design reconstruction (dense and porous) plates perfectly fit on the lower jaw of goat as shown in Figures 3a and 3b. The screw hole slots are tapered so that the screw head should completely sink inside the slot as shown in Figure 3c. The porous structure attached at the bottom of the plate (Figure 3d) promotes full bone ingrowth. Similar design steps are applied to other goat’s, to obtain the dense and porous plate. Figure 3. 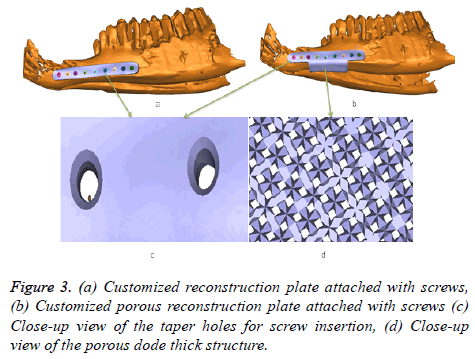 (a) Customized reconstruction plate attached with screws, (b) Customized porous reconstruction plate attached with screws (c) Close-up view of the taper holes for screw insertion, (d) Close-up view of the porous dode thick structure. Prior to EBM fabrication, the lower jaw model and the porous plates are produced using an EnvisionTEC 3D printer. The EnvisionTEC 3D printer uses Stereolithrography (SLA) type technology to provide high precision polymer based models for fitting and evaluation of the implant on the goat jaw model as shown in Figure 4. Figure 4. 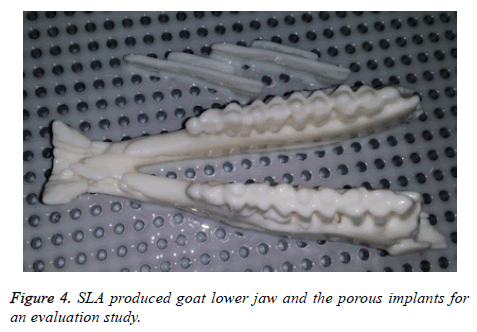 SLA produced goat lower jaw and the porous implants for an evaluation study. If the produced polymer implant found to have any deviation or error in the fitting evaluation, the implant is redesigned and re-evaluated. The final corrected designed plate is then fabricated using Ti6Al4V by EBM technology. 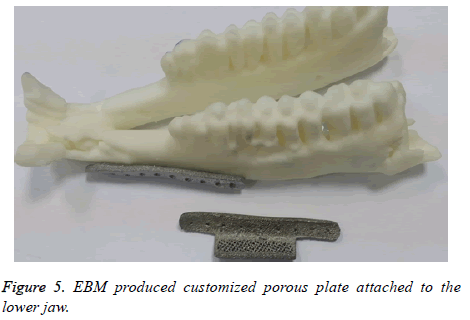 As shown in the Figure 5, the EBM produced customized porous plate fits perfectly onto the lower jaw model. Figure 5. EBM produced customized porous plate attached to the lower jaw. Ethical guidelines: The present study was approved by the College of Dentistry Research Centre for the ethical treatment of animals, in conformity with the NIH-guidelines for the care and use of laboratory animals (NIH Publication #85-23 Rev. 1985). Preparation of animals: All the goats were vaccinated for common illnesses and allowed to acclimatize to the laboratory environment for 5 days. They had unrestricted access to food and water throughout the period of the experiment and were maintained in a simulated environment comprising 12 hourly light and dark cycles under controlled temperature (21-24˚C) and relative humidity (45-55%). Pre-operative assessment: The goats were assessed preoperatively upon arrival to the animal housing facility and immediately before surgery. The following parameters were evaluated with the respective surgical images as illustrated below. 1. Mandibular length-The mandibular length on the surgical side was measured from the angle of the mandible to the mid-symphysis. In order to facilitate reproducible longitudinal measurements, the angle and symphysis were marked by non-resorbable silk sutures. 2. Occlusal record-Preoperative maxillo-mandibular bite registration was obtained using elastomeric putty impression material. 3. Physical status-The goats were generally examined and their weight was measured. 4. Oral function-The ability of the goats to chew normally was recorded. Randomization and animal grouping: The experimental goats were divided into 5 each in one of the two groups by picking lots from an opaque container. The study groups were as follows. 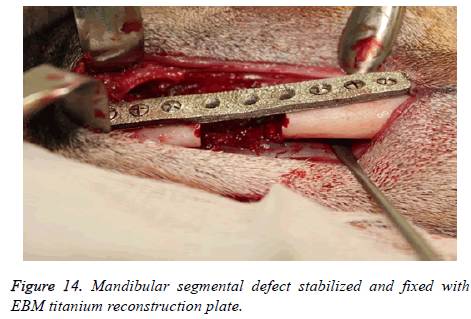 Group 1: Mandibular segmental defect was reconstructed using customized dense reconstruction plate from EBM. Group 2: Mandibular segmental defect was reconstructed using a customized porous reconstruction plate from similar EBM process. Groups 1 and 2 undergo CT scanning prior to surgery for the design of the customized reconstruction plates as explained earlier. The goats are provided with ear tags as an identification number for their respective customized designed reconstruction plates. General anaesthesia and surgical procedures: The goats were made to fast for 12 hours in preparation for the procedure and general anaesthesia was achieved by intramuscular injection of xylazine (5 mg/kg, Lloyd Laboratories, Shenandoah, IA, USA), acepromazine (1.5 mg/kg, Vedco, St. Joseph, MO, USA), and ketamine (20 mg/kg, Sigma Chemical, St. Louis, MO, USA). 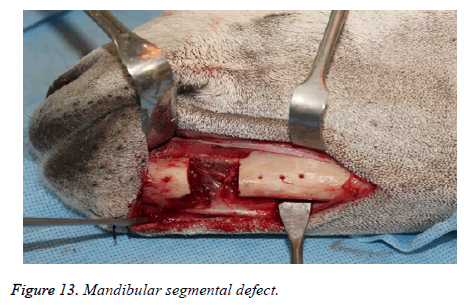 The experimental mandibular segmental defect was created in the left mandibular parasymphysis region in all the study animals using an extra oral surgical approach. Following anaesthesia the animals were positioned in a right lateral position with the head end slightly depressed to avoid aspiration of secretions. The surgical site in the left mandibular region was shaved and disinfected with 10% povidone iodine solution and isolated with sterile drapes. Under aseptic protocol, subcutaneous injection of 1.8 ml of local anaesthetic (lidocaine 2%, Parhawk Laboratories, Inc., Lenexa, KS, USA) containing epinephrine (1:100,000) was done into the surgical site. A 5 cm linear incision was marked along the lower border of the mandible and the skin was incised using a No.15 Bard- Parker blade on handle. The incision and dissection were extended through the skin, fascia, muscle and periosteum to expose the edentulous area in the parasymphysis. The mental neurovascular bundles were identified and ligated. The reconstruction plates were then adapted to the mandibular body and fixed with screws (2.5 mm Synthes Matrix Mandible screws, length 14 mm, Synthes®, Soletta, Switzerland). After marking the segmental defect margins, the reconstruction plate was removed. 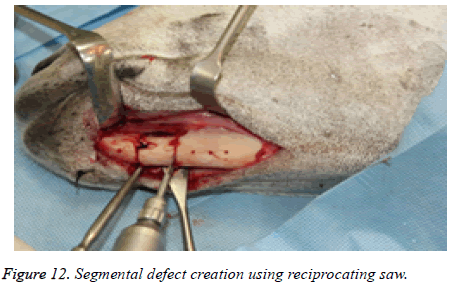 The segmental defect was then completed using a reciprocating saw under saline irrigation. Using the previously drilled pilot holes the reconstruction plate was fixed to the mandible. The surgical site was cleaned, debrided and primarily closed in layers using Vicryl (3-0) and Braided Silk (2-0) interrupted sutures. The respective surgical images illustrate the surgical process for goat implants as shown from Figures 6-14. Figure 6. 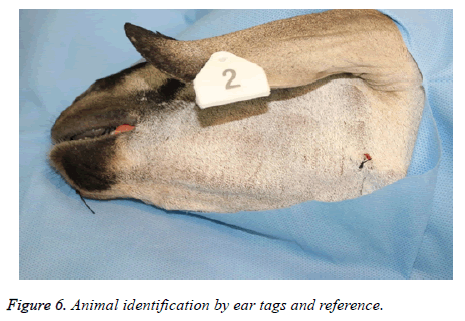 Animal identification by ear tags and reference. Figure 7. Pre-operative occlusal record using elastomeric putty impression material. Figure 8. 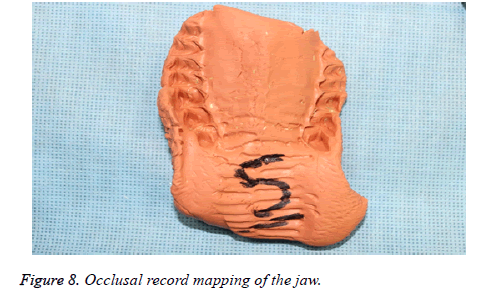 Occlusal record mapping of the jaw. Figure 9. Incision line along the lower border of the mandible. Figure 10. Positioning and fixing the reconstruction plate (Dense reconstruction plate). Figure 11. 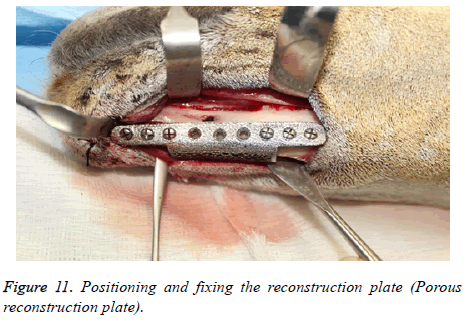 Positioning and fixing the reconstruction plate (Porous reconstruction plate). Figure 12. Segmental defect creation using reciprocating saw. Figure 13. Mandibular segmental defect. Figure 14. Mandibular segmental defect stabilized and fixed with EBM titanium reconstruction plate. Postoperative assessment: The following post-operative parameters were evaluated at weekly intervals for up to 6 weeks. 1. 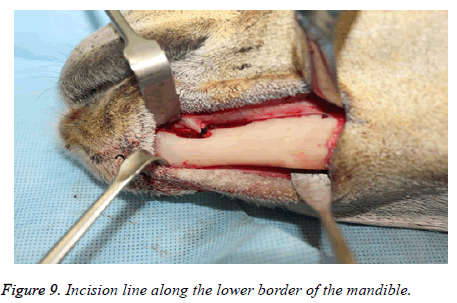 The mandibular length was measured from angle to symphysis using the marking sutures. 2. The occlusal records were used to evaluate maxillomandibular relation and malocclusion. 3. The weights of the animals were measured every week to identify any weight loss due to health deterioration or poor feeding habits. 4. Oral function was assessed every week to examine the ability of the animals to chew food normally. 5. In addition, the surgical site was examined for any wound dehiscence or foreign body reactions to the implanted reconstruction plates. Post-operatively the animals were monitored for signs of pain, infection and proper functional activity. Parenteral (intramuscular) antibiotic (2.5 mg/kg Amoxicillin broad-spectrum, long acting antibiotic “Betamox LA, Norbrook North Ireland”) and analgesic (Temgesic® 0.02 mg/kg) were administered for 5 days postoperatively. During the immediate post-operative period, the animals were fed with soft cooked cereals and vitamin supplements to promote healing. After a period of 2 weeks post-surgery, the animals were provided ad libitum access to a conventional cattle diet comprising, wheat straw, barley cereals and water. All animals were observed for a period of 6 weeks under veterinary supervision, following which they were discharged to the farms. At 12 weeks post-operatively, the goats were sacrificed and radio graphical analysis was performed. The results of the CBCT scan are presented in Figure 15. There was good wound healing at the surgical site without any dehiscence or foreign body reactions and no significant differences in the clinical parameters were observed in any of the study groups. Results obtained through mimics® illustrates the healed segmental defects with bone filling the defect both in straight and porous plate as shown in Figure 16. Figure 15. The healed segmental defects of two different goat with (a). Straight reconstruction plate and (b) Porous reconstruction plate after 3 months (arrows indicating the bone filling the defects). Figure 16. 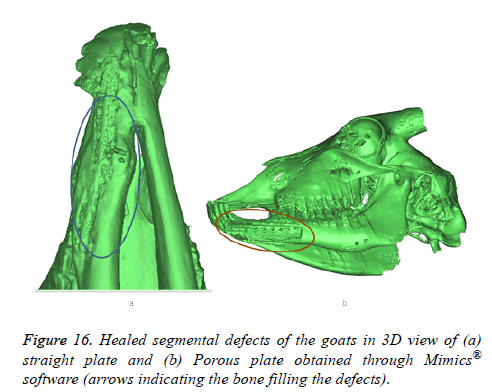 Healed segmental defects of the goats in 3D view of (a) straight plate and (b) Porous plate obtained through Mimics® software (arrows indicating the bone filling the defects). The mandibular length as measured between the angle and symphysis markers remained the same in all the animals throughout the study period as shown in Table 1. Although generalized reduction in weight was observed in all the animals, it was not statistically significant (mean pre-operative weight 25.29 ± 0.59 Kg; mean post-operative weight at 12 weeks 24.94 ± 0.70 Kg; mean reduction in weight 0.35 ± 0.19 Kg) and hence could not be attributed to reduce oral intake as a result of the reconstruction plates. A plausible explanation for the generalized reduction in weight could be the isolated housing condition of the goats in the animal housing facility for the first 6 weeks following surgery, after which they were sent back to their native farm environment until. The Maxillomandibular occlusion remained stable throughout the study period, indicating anatomic and functional stability of the reconstruction plates used. Table 1. Pre-operative and post-operative (12 weeks) clinical parameters of the study animals. Titanium and its alloy have a proven track record of use as biomedical implants due to their excellent biocompatibility. In this study a set of 10 reconstruction plates incorporating two different designs, were manufactured in Ti6Al4V using DICOM files obtained through medical imaging, Image processing, digitized implant design and evaluation. The response of the EBM fabricated Ti6Al4V reconstruction plates were biologically assessed in goats for a period of 12 weeks. The present study outcomes show that the EBM fabricated Ti6Al4V reconstruction plate designs exhibited good biocompatibility, in addition to anatomical and functional stability. The study animals were capable of performing their oral functions without any hindrance following a segmental mandibular defect which was reconstructed using EBM fabricated Ti6Al4V customized implants. Moreover, the absence of any potential foreign body reactions towards the Ti6Al4V implants, indicate the excellent biocompatibility of such implants when used in a real time biological animal model. Further long term histopathological studies would however be required to identify long term function of the tested implants and the ability of Ti6Al4V to osseintegrate to the host bone tissue. The present study proves that customized EBM fabricated Ti6Al4V reconstruction plates are a viable alternative to the commercially available reconstruction plates fabricated through casting and machining because of their associated advantages like flexibility, reduced weight, reduced fabrication cost and the opportunity to produce complex, customized and tailor made implants. The project was financially supported by King Saud University, Vice Deanship of Research Chairs. Ducheyne P, Healy K, Hutmacher DE, Grainger DW, Kirkpatrick CJ. Comprehensive Biomaterials. Newnes 2015. Oshida Y, Tuna EB, Aktoren O, Gencay K. Dental implant systems. Int J Mol Sci 2010; 11: 1580-1678. Al-Ahmari A, Nasr EA, Moiduddin K, Alkindi M, Kamrani A. Patient specific mandibular implant for maxillofacial surgery using additive manufacturing. International Conference on Industrial Engineering and Operations Management (IEOM) 2015. Osman R, Swain M. A critical review of dental implant materials with an emphasis on titanium versus zirconia. Materials 2015; 8: 932-958. Puppi D, Mota C, Gazzarri M, Dinucci D, Gloria A. Additive manufacturing of wet-spun polymeric scaffolds for bone tissue engineering. Biomed Microdevices 2012; 14: 1115-1127. Li X, Feng YF, Wang CT, Li GC, Lei W. Evaluation of biological properties of electron beam melted Ti6Al4V implant with biomimetic coating in vitro and in vivo. PLoS One 2012; 7: e52049. Murr LE, Gaytan SM, Martinez E, Medina F, Wicker RB. Next generation orthopaedic implants by additive manufacturing using electron beam melting. Int J Biomater 2012; 2012: 245727. Wieding J, Jonitz A, Bader R. The effect of structural design on mechanical properties and cellular response of additive manufactured titanium scaffolds. Materials 2012; 5: 1336-1347. FDA Clearance, Arcam. Arcam announces FDA clearance of implants produced with Additive Manufacturing. Arcam AB 2015. Khaja M, Abdulrahman AA, Abouel NE. Evaluation of titanium alloy fabricated using electron beam melting and traditional casting technique. Biomed Res 2016; 27. Nasr EA, Kamrani A, Al-Ahmari A, Moiduddin K, Digital design and fabrication of customized mandible implant. World Automation Congress (WAC) 2014: 1-6. Harrysson OL, Cansizoglu O, Marcellin-Little DJ, Cormier DR, West HA. Direct metal fabrication of titanium implants with tailored materials and mechanical properties using electron beam melting technology. Mater Sci Eng 2008; 28: 366-373. Christensen A, Kircher R, Lippincott A. Qualification of Electron Beam Melted (EBM) Ti6Al4V-ELI for orthopaedic applications. Proc Mater Process Med Devices Conf 2007. Haslauer CM, Springer JC, Harrysson OLA, Loboa EG, Monteiro-Riviere NA, Marcellin-Little DJ. In vitro biocompatibility of titanium alloy discs made using direct metal fabrication. Med Eng Phys 2010; 32: 64-652. Ponader S, Vairaktaris E, Heinl P, Wilmowsky CV, Rottmair A, Korner C, Singer RF, Holst S, Schlegel KA, Neukam FW. Effects of topographical surface modifications of electron beam melted Ti-6Al-4V titanium on human foetal osteoblasts. J Biomed Mater Res 2008; 84: 1111-1119. Arcam AB. Ti6Al4V material 2016. Venugopalan R. Medical device materials. ASM Int 2006. Derand P, Rannar LE, Hirsch JM. Imaging, Virtual planning, design, and production of patient-specific implants and clinical validation in craniomaxillofacial surgery. Craniomaxillofacial Trauma Reconstr 2012; 5: 137-144. Harrysson O, Deaton B, Bardin J. Evaluation Of titanium implant components directly fabricated through electron beam melting technology. Proc Mater Process Med Device Conf 2006. Cronskar M, Backstrom M, Rannar LE. Production of customized hip stem prostheses–a comparison between conventional machining and electron beam melting (EBM). Rapid Prototyp J 2013; 19: 365-372.